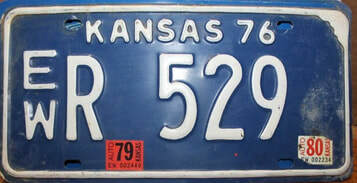 The State of Kansas has changed the rules of Antique Tags and what constitutes an " Antique Vehicle". Below is a document of the rules for an Antique Tag and with these new rules 90% of the Tags placed are in violation. NOTE: Just because the vehicle “year” on the title or bill of sale indicates the model year is 35 years old or older does not in and of itself make the vehicle an antique. You must ask questions if the vehicle has been modified, newer motor, transmission, etc. The Vehicle Must Be Full Original or Complete Original As Possible​! ​Original Motor , Transmission, Body, Frame and Tire and Wheels. To qualify as an antique the vehicle must be as close to the original as possible, without any significant alternations to the major component parts (motor, transmission, frame, wheels AND tires or body). Replacement motors and/or major component parts1 must be of the same vintage2 as the model year of the antique vehicle. Modifying or installing a newer and/or different style of motor and/or transmission into a vehicle with a model year that is 35 years old or older would not constitute an antique vehicle. This includes, but is not limited to, mounting tires and wheels which are not the same size or the modern-day equivalent as those installed by the manufacturer for that model year vehicle. EXAMPLE: A major difference would be, but not be limited to, a 1951 model that was not manufactured with a V-8 motor but the same model manufactured in 1953 had V-8’s. The 1953 V-8 could not be installed in the 1951 and maintain antique status. We Need YOUR Help STOPPING THIS!